Charly was one of the kindest men I have ever known -- always ready to help a friend. In the early '80s, I was leading a photo safari workshop on the Y.O. Ranch and had invited Leonard Lee Rue, perhaps the most published wildlife photographer in the world at the time, to come down from his native New Jersey to assist. I told Leonard I'd meet him at the airport and we'd drive together to the Y.O. When it came time for him to book a flight, he looked at the map and decided San Antonio was closer to Kerrville and the Y.O. than Austin, but he didn't tell me what he was thinking. I live in Austin. Another writer friend of mine and Charly's, the late Russell Tinsley, accompanied me to the Austin airport to say hello to Rue. I didn't see Rue's flight number on the monitor, and asked about the flight. An attendant told me -- to my horror -- that that flight flew into San Antonio, not Austin, and would be landing within minutes. I asked him to see if Rue was on it. Security was getting tighter, then, and he told me he couldn't do that. I explained my panic and asked for his help in any way. He checked his computer, took a deep breath, and said San Antonio was nice that time of year and maybe I'd like to see it. 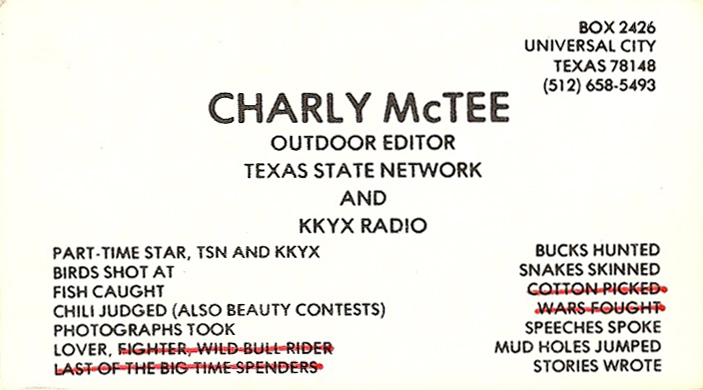 Knowing it was impossible to make it the 75 miles to San Antonio in time, Tinsley suggested I call Charly. I did, and caught him at the radio station. He chuckled at my plight, but quickly volunteered to pick Rue up and baby-sit him until I got there. I dashed down I-35 to the radio station. Charly and Rue were drinking coffee and visiting when I arrived. Charly shrugged off my gratitude by saying he enjoyed taping a couple of interviews with Leonard and appreciated the opportunity. Photo courtesy of Rod Rodriguez. Copyright 2013 by John Jefferson & SanAntonioRadioMemories.com – All Rights Reserved.